A mixture of cool celery, sweet and succulent chicken, and crunchy almonds, nothing tastes more refreshing on a hot Summer day. It’s been so hot and humid here in Cleveland, I’ve been looking for meals that won't heat up my kitchen, so I decided to make a quick and easy chicken salad sandwich's for lunch. Delicious chicken salad topped on a fresh and flaky croissant is the perfect Summer lunch time treat for the whole family. 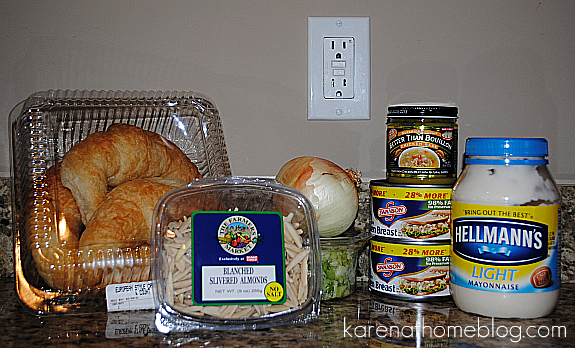 Combine chicken, Hellmann’s Light Mayonnaise, celery, almonds, onions and chicken base in medium bowl. Season with salt and black pepper if desired. 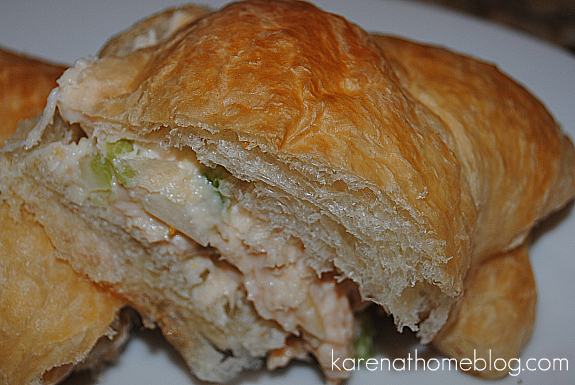 Spoon chicken salad onto croissants. Enjoy! I'm always looking for a new chicken salad recipe! thanks! Thanks for sharing... I am gonna try is soon and will let you know how it turned out to be! Karen this sounds delish! I'm going to try it soon. It's been really warm here as well. We make a similar version but instead of onions, we use grapes! It's super good and you are right, perfect for summer! I have never thought to use a Chicken Base in a chicken salad. Now I finally have something else to use the big jar of it that I have. Genius! Yum! I am definitely going to try those! Sounds quick and easy. I've never bought a chicken base. What is that? This looks quick, yummy, and easy. It would be just right for a summer supper.